An interesting study in a player during a major transitional period of professional football , Dublinski starred at Utah but was only an 8th round pick in the 1952 NFL draft. 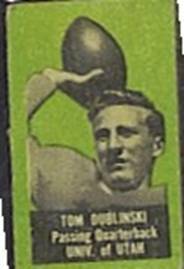 However, Dublinski made the (then) powerhouse Detroit Lions, playing with them in 1952 and 1953, but was stranded behind Hall of Fame QB Bobby Layne and started only 5 games at the pivot position. Despite playing on the NFL championship team in his first two years, and getting into enough games to be ranked fourth among quarterbacks, he came north to Toronto in March, 1955 for a contract that was reported to be the highest in the Big Four. As part of the raiding that went on that year, the Argos went looking for a potent response to Montreal’s Sam Etcheverry. Incumbent starter Nobby Wirkowski was traded to the Ti-Cats and a new coaching staff arrived with an aerial attack in mind. 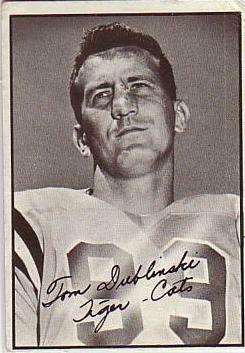 Dublinski came through in 1955, completed 225 of 388 passes for 3561 yards and 30 touchdowns. Those numbers were pretty much even with Etcheverry, being about 100 yards less and with a higher completion percentage than Etcheverry. Dublinksi also sparkled as a defensive back. Partially as a result of Dublinski’s success, the Big Four adopted a rule limiting teams to four NFL players per team. The Argos reported an average salary of $10,000 per import while they paid their top Canadian $6,000 in 1955. 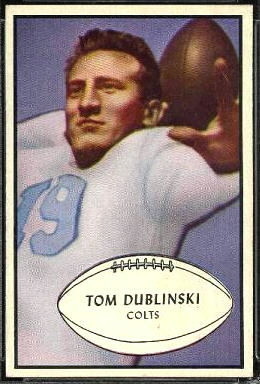 While known for his strong arm, not all of his 1955 season was a march to glory – Dublinski set the league record for interceptions (34) that still stands. In 1956 Dublinski and Argo teammate Gil Mains became the center of the storm surrounding the raiding of NFL rosters when he was sued by the Detroit Lions for breach of contract. In a complicated case it was revealed that he had accepted Toronto’s $17,000 offer which exceeded the Detroit contract of $14,000, intended to replace the $7,500 he had signed for in 1952. Bobby Layne suffered a recurring arm injury and Dublinski was wanted back in Detroit. The Lions legal case took several odd twists on a number of points, particularly when the judge in the case began to question the NFL reserve clause and draft procedures. Technically, the Lions won the breach argument, after two years of litigation, but did not regain the playing services of Dublinski. However, Mains and kicker Jim Martin jumped back to the Lions in September when cut by the Argos. While on the field Dublinski rendered the verdict moot as he injured his knee stepping into a hole in the turf in Vancouver’s Empire Stadium during an exhibition game and was lost for the season. As a result the star quarterback was placed on waivers in September. However, uncertainty about his injury and large salary kept the other clubs from claiming him. A comeback in 1957 with the Argos was hampered by further knee injuries and he shared time with a variety of hopefuls as he connected for 4 TDs and 10 interceptions. In 1958 an attempt to get back into the NFL with the Giants, saw him sign in January, but lasted one game and Dublinski was released in October when it was decided to go with Frank Gifford as the third string quarterback. He returned to the CFL and had limited stints with the Tiger Cats in 1959 (as backup QB to Bernie Faloney) and 1961. In 1960, the Ti-Cats allowed him to try out with the fledgling Denver Broncos in the AFL where he got into three games, but without throwing a pass. He returned to the Argos for one last chance and made the team, but retired in September 1962 when it became evident that he would not be able to dislodge starting QB Tobin Rote (another ex Detroit Lion) and fell to third string behind Tom Maudlin. Tom Dubinski passed away on November 26, 2015.